Lieutenant Commander Victor Hanson tapped the recording stud gently and smiled at the viewscreen. The dusty gray rock spun lazily below his ship as her scanners and cameras diligently snapped pictures and took readings of the small moon-like planet. This felt so very right to the older man. He had worked hard to get this billet. It was like Zen meditation to him, the methodical and regular pursuit of knowledge. Here he was, performing true science. A yeoman walked onto the bridge bearing a platter with a cup of coffee, he nodded in thanks to the yeoman and took the coffee from the platter. He stood and stepped down to the forward helm podium. Ensign Angelica Bennett, a short woman with stunning green eyes and mousy-brown hair, manned the forward science station. Sensing the captain behind her, she stifled a yawn. “Ah, you were working late, were you?” Hanson patted her on the back. Hanson grimaced sympathetically, “I have insomnia whenever we’re in port.” He patted the junior officer affectionately on the shoulder, “So, anything new to talk about out there?” He looked at the shrinking gray sliver on the screen, the orbit of the ship taking them into the inky black dark-side. The alert light in the center of the helm began to beep suddenly, stunning Bennett into silence. Lieutenant Garrison at the helm looked at the light as if it had just suddenly materialized on the console. 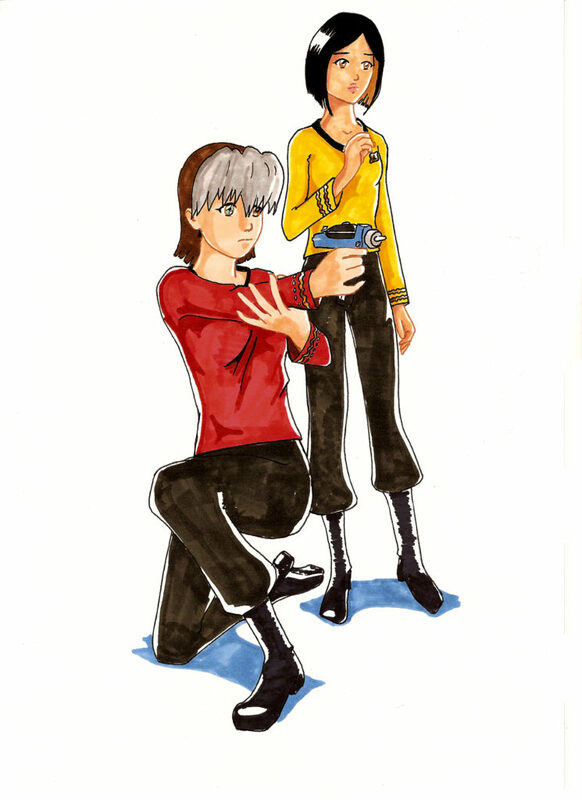 The red alert klaxon began its driving, climbing wail, a very alien sound on the normally placid bridge of the Diana. Things were happening so fast. Bennett turned to her computer, looking over the reports coming in from the enhanced sensors at the small Scout’s disposal. Nothing made sense: It was clearly moving at more than twice c. The sensors showed the object heavily blue shifted and she could clearly see the weird halo effect from when an object breaks Einstein’s laws of physics. But she couldn’t see any power signatures, nor a defined warp field. Even the spectrograph showed only a single, heavy element… like it was an ordinary asteroid… except that it was moving at warp one. Realization dawned on Bennett, Thorium, like Uranium and Plutonium was fissile, meaning it could create nuclear fission. When an object running at a high-speed strikes another, larger object, all of the kinetic energy put into that object to make it go fast is transferred to the larger object as energy, usually heat. The faster the object, the hotter it becomes. When an object is travelling at warp speeds, however, the laws of physics -already being bent- are broken altogether. All of these thoughts crossed Bennett’s mind as she watched the superluminal asteroid strike the small gray world. The first few seconds were unnaturally still. Then an unbelievably bright light, like the dawning of a new day, sprang from the limb of the world as the unnatural amount of kinetic energy was suddenly released. It was only a few seconds later when the cold core of Normex 101911 woke again for a short rebirth, suddenly invigorated by the energy of a million galaxies. It’s life, however, was brief, and the crust of the little world shattered like a crystal globe. The last word Bennett heard on the bridge was Hanson ordering more power to the shields. “I have the signal carrier on my board, skipper, but no response from my hail.” Carter said with a shrug. All of the crew watched the streaking stars on the viewscreen intently. Parker never really noticed how loud the noise of the bridge was until it invaded the horrible silence that stretched on. “Mister Jenkins?” Parker turned to the woman at Tactical. Lieutenant Julienne Cochrane placed her coffee cup on the table behind the transporter console. With a certain fluidity, she toggled on the power to the console. The colorful telltales lit up and began blinking as they ran through their own self-diagnostics. Another routine day for Mars’ transporter room 1. The young lieutenant had been in the mess hall when she was called to her battlestation, she had no real idea what was going on. Probably, she mused, just another drill. Well, she wasn’t about to be caught flat-footed, so she made sure her console was in tip-top shape. The creaking and moaning of the bridge alarmed Bennett. She had felt her stomach lurch a number of times as the grav-plates faltered and then reasserted themselves. Diana was slowly dying. 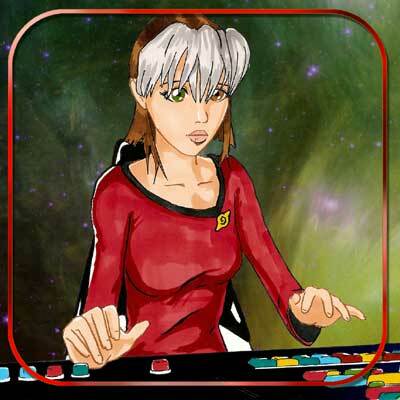 She had been alone on the bridge ever since Ensign Hadley bolted out a few minutes ago. Bennett guessed he had run to the escape pods and, along with a few others, chose to attempt to abandon ship. Bennett turned and glanced at the body of Captain Hanson, crushed under a bridge beam. Without him, many people chose to abandon the ship, even though she suspected the escape pods stood even less of a chance of survival in the sand storm going on outside the ship. Bennett couldn’t blame them, really. They were scientists, and the Diana herself really didn’t have much left in her. Every minute a rock or stone or a mountain moving at a phenomenal speed would strike her failing shields and deflectors. The primary shields failed ten minutes ago, and the deflectors were barely working now. She could see a certain drive toward getting out of here. She watched her dimming science scanner as it gave her what little data it could about the massive chunks of world that surrounded the ship. She drew what little power was left in the batteries and activated the tractor beam one more time, pushing against a massive mountain of molten rock and buying the Diana one more minute. Diana moaned again. The bridge had been struck early on. It was the blow that killed the captain. The roof of the bridge was bent in a way that was completely unnatural. She knew that emergency force fields were all that was holding most of the ship -like the bridge- together. Those fields were in place all over the ship. Those fields were drawing off of the failing batteries, too. She knew it was only a matter of time. Well, she wasn’t going to make it, either, but at least she was at the wheel when things went down. Maybe that was what was important about death; are you in charge when it happens or not? There was a snapping sound, like branches underfoot. Bennetts ears popped: The pressure changed. So, this was it. This was really it. It wasn’t going to be painless, but maybe it would be quick. She wrapped her arms around the helm console, locking her fingers under the console and hugging the panel as tightly as she could. Maybe if she was lucky, she wouldn’t get impaled on ragged debris. A tearing sound, like paper being ripped tore through the bridge. The sound then became tinny and distant, almost like the torn paper flew away suddenly. Bennett squeezed her eyes shut and opened her mouth. Her lungs collapsed as the air was taken from her in a split second. Her grip gave way and she felt herself falling free. Within seconds a pain like she had never experienced before lanced though her arms and legs. Her blood was boiling away. She couldn’t scream, but she wanted to so badly. It was taking forever for her to die… and she wanted it to end, now. Maybe Ensign Hadley had the right idea. “Transporter room one, MAE WEST! 209 mark 4!” Came the call through the intercom. Mae West? Thought Cochrane, A person adrift in space? She moved quickly to set the targeting scanners to the coordinates sent by the bridge. A Mae West was a really hard procedure: grabbing a two-meter object drifting in space within a 25 second window. It was pretty much the hardest thing a transporter tech could ever have to do. If this was a drill, they had it in for her. The targeting scanners resolved the picture and Cochrane’s heart sank. It was a saucer of a Federation ship. She could clearly see the battered hull and wreckage. Somewhere in there were people, being ejected into space. This wasn’t a drill. This was real. Sweat beaded on her forehead as she swept the scanners across the battered hull, disregarding anything that was the right size but wrong composition. Quickly she identified a target, set the pattern buffers and pulled the sliders to energize the coils. The shower of golden glitter resolved on the pad, consolidating into a humanoid form. But it was clear that the figure forming on the pad was no longer with us, her eyes were gone, sunken into her skull and her dark, mottled skin was like parchment. The head was arched back in rigor, mouth open in an eternal scream and the hands were splayed. As the beam let go, the body toppled, dead-weight, off of the pad. Cochrane moved fast, resetting the buffers and coils. She swept the hull again. The containment fields of the ship were completely down, the clock was already ticking, and the complete cycle of the transporter could only be scraped down to 19 seconds at best. She locked into one more target, she slammed the controls to lock the scanners, and yanked down as hard as she could on the coil sliders. The familiar trill of the coils charging responded and the pad once again lit up with a column of golden light. Like before, the woman on the pad looked like she was already gone. Her head was thrown back in a scream and her arms and legs were shriveled. But the beam let her go and she took a ragged breath. Then the woman on the pad screamed and began to curl up into a ball. She couldn’t activate the transporter while the woman was on the pads, so she ran around the console and went to the woman’s side. She cradled the woman’s head, looking at her. She was in horrible shape, her arms and legs looked like sticks, completely desiccated, blood pooled from her left eye and ran down onto Cochrane’s leg. It was only seconds before the door to Transporter One hissed open and a tall, lanky doctor and two medical techs entered the room leading a stretcher. They lifted the crumpled woman out of Cochrane’s lap and placed her gently on the stretcher. She no longer screamed, but now simply whimpered. Cochrane watched in shock as the stretcher was pulled away from the pads. The doctor nodded to Cochrane. “You’ve seen enough for one day. You’re off duty for 24 hours- try to get some rest.” He waited for Cochrane to nod that she understood and then he bolted through the door. Cochrane went over to the console, shut down the transporter and secured the system for warp speed. Her hands moved by themselves. Later, she wouldn’t even remember if she shut the system down or not. The Mars was deft and agile. The distortions in space and time had healed themselves enough that the destroyer gained ground and projected a normal warp field. She cleared the newly born asteroid field and left the system in quick order. Deep in the middle of the saucer of the ship, in her quarters, Cochrane lay on her bed. She had showered and cleaned off the blood, but the woman on the transporter pad still stayed with her. Sickbay on a destroyer is small and cramped. Part of Shuttlebay 1 had been converted into a triage area. Cochrane wove her way around the Mars’ medical personnel and some MACO medical technicians. She found a nurse looking over a PADD. “I… Um… Thank you.” Cochrane didn’t know what else to say. She excused herself politely and went to the far corner of the shuttlebay where small sterilizing force-fields clipped and hummed around old-fashioned curtains to make little medical cubicles. Outside #24 stood a MACO, armed. Cochrane looked at him and her brow furrowed. 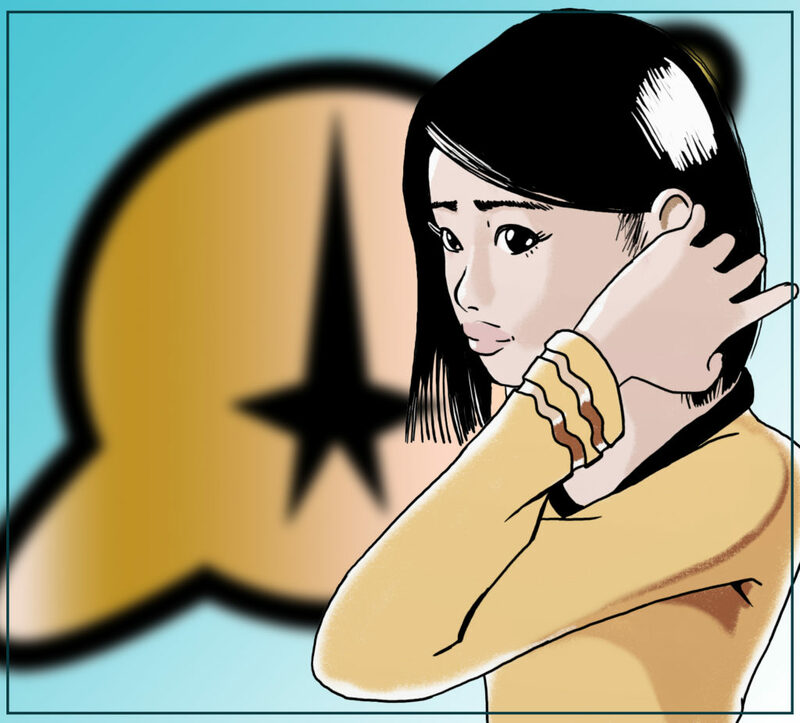 “Can… can I go visit her?” Cochrane asked. “Makes sense, sir. I would certainly want to in your shoes.” He grinned again, stepping aside so she could make her way through the curtain. Almost half of a person’s mass is in their extremities, the arms and legs. When Cochrane looked at the tiny figure in the medical bed, she almost cried out in spite of herself. The small brown-haired woman had regained her color, and her left eye was bandaged, but her arms and legs were completely missing. Of her brown hair, she could only see tufts sticking out from the bandages. Cochrane couldn’t help but notice just how small she was, so amazingly small. “That bad, eh?” a small voice said from the bed, snapping Cochrane out of her reverie. “I’m not sure… do I call you sir or ma’am?” Bennett asked weakly. Bennett laughed. It was weak, but it was heartfelt. Cochrane smiled at her. Cochrane returned to shuttlebay 1 every day for the next week. It was clear that Bennett’s body was getting better, but it was also becoming even more clear that her mind was not. Not only was the young woman understandably depressed, but she seemed to have trouble remembering things from time to time. “Does this mean she is going to die?” Cochrane asked quietly. Cochrane looked at the deck plating for a moment. “What will you need me to do?” She asked, looking the doctor in the eye. Cochrane returned to her quarters. For 15 minutes she stood in the shower, letting the doctor’s words run over her head like the water from the tap. What would it be like to have gone through what Bennett had gone through? Was there anything Cochrane could have done differently? Could she had cycled the transporter faster? What of she had locked on to Bennett first and not the corpse? Despite the logical part of her brain telling her over and over that it wasn’t her fault, her heart grew heavier with guilt as she watched the other woman slip further away. Slowly Cochrane lifted herself from her bed and got dressed. “Its…” Cochrane started, then faltered. Cochrane nodded but she still looked troubled. Cochrane gave him a brief smile and left his office. “Your Captain Parker has been down here a couple of times today. Nice guy. Is he married? I mean, I’m a captain now too, right?” Bennett shrugged a little, one of the few things she could actually do. Bennett began to sob, the horrible sounds of a woman who has finally broken. Cochrane leaned over and wrapped her arms around Bennett. For many minutes they stayed like that, Bennett crying the last of her grief out on Cochrane’s shoulder. Finally Bennett stopped crying and began to regain her composure. Cochrane let the other woman go gently and laid her back on the bed. She nodded and reached for a Padd that was lying on the table by her bed. The hours passed quickly as Julie Cochrane listened to Bennett tell her life’s story. 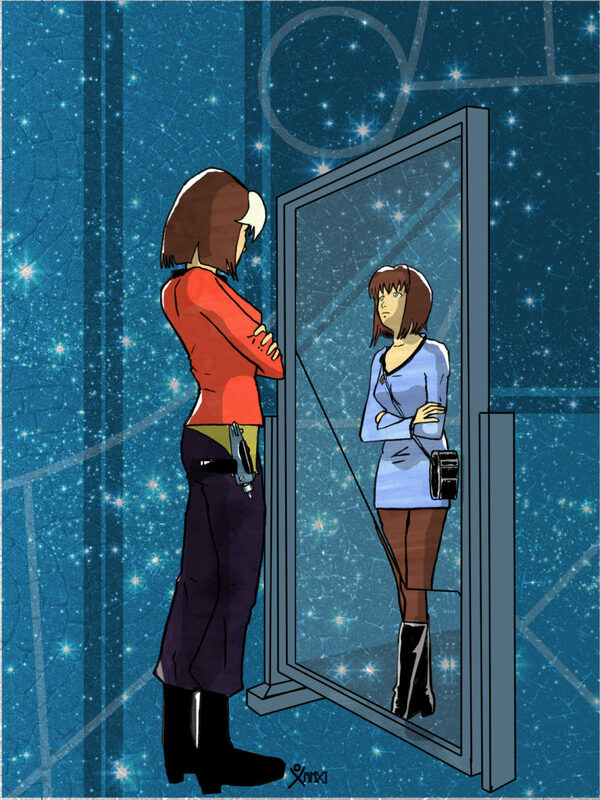 She detailed every memory, everything that drove her into science and then into Starfleet. She detailed her loves, her losses. At some point Cochrane began to realize that she was hearing the testimony of a human life as it left forever. Days passed, and Bennett’s testimony became more scattered, more disjointed. As the neurons in her brain slowly degenerated, she began to forget things. Cochrane helped her piece together what she could, but it was clear she was losing her mind. The approach to Starbase 29 was clear and uneventful, the Mars pulled into a smart orbit around the planet and then lined up with the large station. Bennett was among the most critical and as soon as the Mars was in transporter range, Bennett was wheeled into Cochrane’s transporter room. Julie powered up her console and then walked over to the gurney. Bennett looked at her and smiled. “I remember you, Julie.” She said simply. The doctor placed a gentle arm on Cochrane’s shoulder, indicating that it was time to go. Cochrane took her place behind the console and reset the buffers for transport. 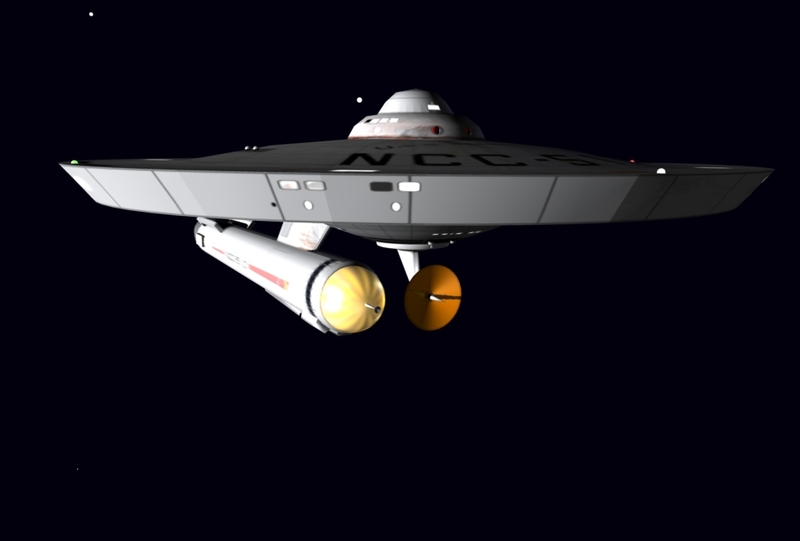 Once the gurney was on the pads and Doctor Williams had retreated, she connected the transporter carrier signal to Starbase 29 and pulled the sliders that energized the transporter coils. Bennett was replaced slowly by golden sparkles of light, dancing over her small body like fireflies. The sparkles consumed the woman and the gurney and then retreated, leaving an empty chamber. Williams patted the small woman on the shoulder again and walked out the door. 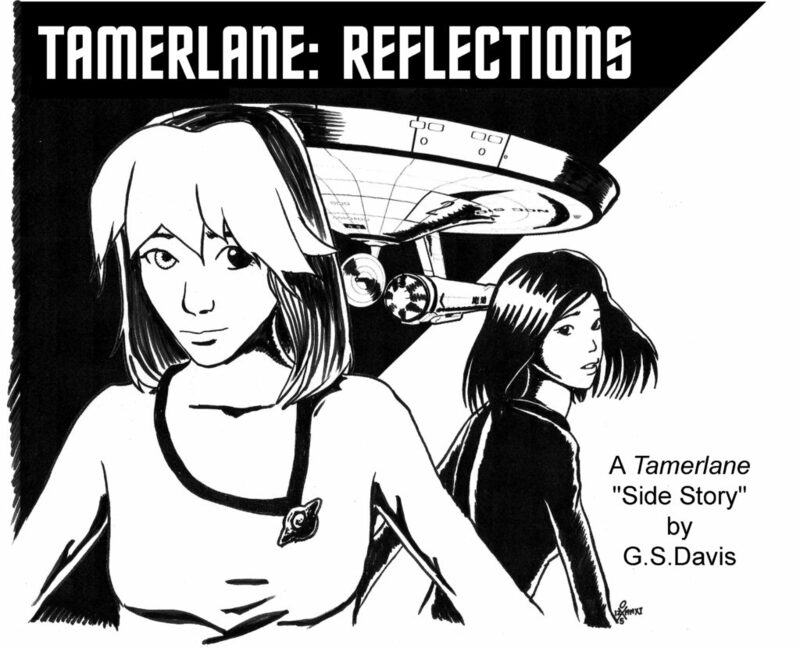 Commander Julienne Cochrane walked into the Tamerlane’s transporter room just as the golden sparkles resolved into the familiar figure of her first officer. “I had to stop at the gift shop and buy you candy,” Bennett said earnestly. “I also had to stop at a coffee shop and eat the candy I bought you. I had to make sure it wasn’t poisoned,” Bennett added calmly as she hefted her overnight bag over her shoulder. “Ah, well thank you.” Cochrane said as the two women walked out of the transporter room and headed for Bennett’s quarters. Cochrane laughed in spite of herself. The door to Bennett’s quarters hissed open as she approached and they both went inside. Bennett placed her bag on the bed and dropped into the chair beside her bed. “Okay, you’ve been unusually quiet this entire time, what’s going on?” she said to her captain. “Angie, do you want to ever read it?” Cochrane sat down on the foot of the bed. Bennett shook her head, “Julie, I remember floating in space, the Diana drifting away from me. I remember the boiling of my own blood in my veins, I remember the immense pain as little bubbles popped under my skin. I was going to die slowly and very painfully. To me, you saved me the moment that transporter beam locked on. In that medical ward, I wanted to die again. I was plotting my own death and you popped in and told me stupid jokes and made me laugh. So you saved me twice. “So… wait… you saved me?” Julie whispered. Admiral Jenkins and Admiral Smith-Harper sat across from each other at the long, wooden table in the Gardner room of Starfleet Command. Outside the large ovoid windows, the city of San Francisco bustled on with its everyday tasks, blissfully unaware of what was going on inside. “That’s the last deposition, sir. Commander Bennett was the only person who survived that actually saw the projectile itself.” Smith-Harper was a tall, thin woman with dark skin, short-cropped brown hair and piercing black eyes. “Does it match the profile?” Jenkins was her diametric opposite, rotund and sporting a gray beard and matching white hair, lines etched his face. Jenkins looked back at the reports, the gravity of the situation settling in on his shoulders. So it wasn’t an accident or a fluke. It was intentional. Smith-Harper nodded and left the room, leaving Jenkins alone with his thoughts. We’ve faced this before, and we will face it again.